Tile-laying games are great for game evangelists: many have simple rules so are family, new gamer and child friendly. We all know the concept from Dominoes, and its amazing how little you have to add to that simple premise to make a truly great game. Tile games also have very strong curb appeal, looking great on the table and really catching the eye – and imagination – of anyone walking past: much like a jigsaw can do, but with much more game appeal across the age and ability ranges. Games are linked by the title where I’ve reviewed them elsewhere on the site (not many this time – sorry!) – and pretty much all of them are easily found in stores and online. And, as always, if you have any questions or want more info – or have your own recommendations – just pop them in the ‘comments’ below. Tsuro ticks so many ‘perfect filler game’ boxes: lovely production, simple gameplay you can teach in a couple of minutes (and to people as young as six or so), a short play time, easy setup, easily available and only about £20 – and can take up to eight players. The gorgeous oriental dragon art does a nice job of masking the very abstract route-building gameplay: place a square cardboard tile into the 6×6 grid (each of which has two routes on each of the four sides), then move your dragon along the path created. The aim: keep your dragon on the board as long as possible, before your route takes you back off the edge of the board. While probably best with four or more it may have a bit too much downtime (and too few turns) for some at eight players, but turns are fast and I think it does hold up across the player counts. Medina is a gorgeous board game where the ‘tiles’ are actually wooden blocks representing buildings, merchants, rooftops and city walls. It’s an abstract game where players take it in turns to place a couple of pieces onto the board and later claim buildings to earn points. The timing of these claims is key: go too early and your opponents will fence it in, making it low scoring – but leave it too long, and someone else may beat you to the claim. The game’s simple rules make it child (probably 8+) and family accessible, while the aesthetic will appeal to almost everyone. And it is definitely a game where your ability will improve the more you play. Medina’s only real negative is its very abstract nature that some players simply won’t be able to move past (shame on them). Should be easily available thanks to a 2014 reprint. This game of laying hexagonal tiles has a neat twist: a bit like bingo, one player draws a tile and everyone has to play the exact same tile from their set, but they can lay it anywhere inside their 19-tile grid. Each tile has three coloured lines cutting across it, and each colour has a number on it. You’re trying to get a coloured line go unrestricted from one side of your grid to another – and if you do you’ll get the points of the coloured line times the number of tiles you got in a tow (three to five, depending on where in the grid the hexes are). It’s a shame the end of the game is a bit mathsy, but once again it is quick to learn, very accessible to kids and families, and sometimes seen in charity shops. I actually prefer Karuba (2015), which is clearly inspired by Take it Easy but has a nicer adventuring theme and less maths – but is a little longer (30-40 mins), less flexible (only 2-4 players) and a little more expensive. 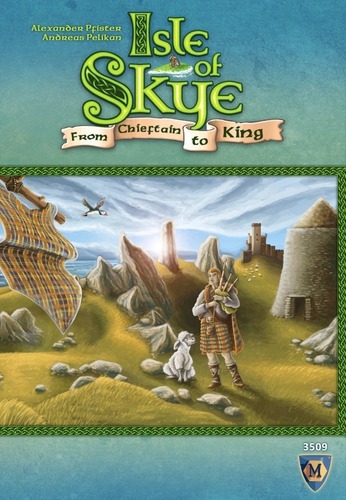 In Isle of Skye each player is making their own little Isle by buying tiles in an effort to score the most points. But different players will be going for different things (boats, sheep, whiskey, mountains etc) – and each turn you’ll draw three random tiles and price each one. Each player can then buy one tile from someone else – so the trick is to make ones you don’t want affordable/desirable (to get income) – before buying any of your own tiles that weren’t bought. This economic/auction angle isn’t for everyone, but the rest of the mechanisms are pretty straightforward. The game is a little step up in complexity from Carcassonne, but a great next-buy for anyone who likes the general feel of that game. If you want to go a step further, The Castles of Mad King Ludwig has similar mechanisms (but the pressure is on one player to set prices each round); while Glen More also sees you building up your own little scoring tableau, while negotiating a clever rondel mechanism that governs both your tile choice and turn order. If you like a tongue-in-cheek sci-fi theme and find the usual tile-laying experience a little pedestrian, how would you like the chance to frantically build a space ship out of tiles in real time – complete with guns, engines, crew and storage space? And then fly it through alien infested asteroid fields and watch as half (and often more) of it is smashed to bits or vaporised on the way to your destination? 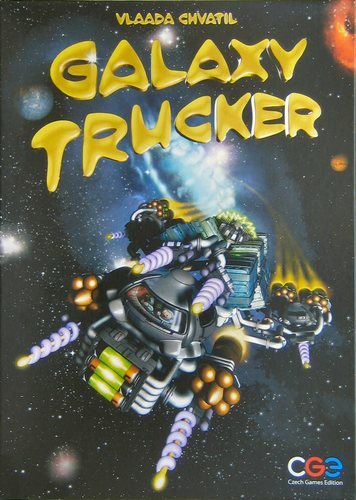 Then Galaxy Trucker is the game for you. The base game is great fun if you’re all at the same level – and if you get good at it, there are multiple expansion packs that ramp up the chaos with a bunch of new bits added to the mix. It’s a bit more of a gamer’s game (about £40 and ages 10+) but with the right crowd it’s an absolute hoot and you certainly get your money’s worth in terms of components and replayability. And while the flying bit takes longer than the tile-laying, ship-building bit the ship building is definitely where the real game is. While most definitely a tile-laying game, Alhambra is the closest game on the list to being disqualified for having too much else going on. You have to collect sets of cards (which count as currency) to buy the tiles you want from a display, but the meat of the game is most definitely on the tiles: you’re trying to get the highest number of tiles in any given colour to get points in the three scoring rounds, while also placing them in such a way that the walls match to both give you more points and not restrict you too much as you build. The game has many expansions, so if you start to tire of the base game there are loads of ways to add little complications to the mix. This is a bit of an indulgence, as it is both hard to find in the UK and the best rules are an amalgamation of the original and later edition (Exploring New Horizons) – but it is one of my favourite tile laying games. 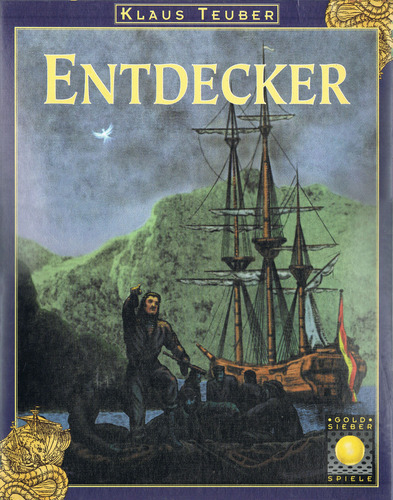 Players explore by placing the game’s ship piece onto the board on an existing sea tile and saying how much money they’ll spend on their expedition to discover the new world. Face-up tiles can be bought, but are expensive – so it’s more fun, potentially more lucrative, but more risky to take face-down ones. When your move is over (usually when you run out of money, hit land, or decide to stop) you can place settlers on the final tile if it has land on it – and if it completes an island, players with the biggest colonies on it will claim points. Special tiles (some good, some bad) add a little extra exploration chaos and (accepting a few rough edges) Entdecker is simply good fun. One of the famous gateway game trifecta alongside Ticket to Ride and Catan, the Carcassonne base game is a simple, elegant and lovely looking game for families, kids and gamers alike. The game that spawned the ‘meeple’ (little wooden dudes) now ubiquitous in the hobby, the game sees you draw a tile, add it to the growing shared tableau (see the pic at the top of the post), then decide whether to place one of your meeple on it. You’re trying to build complete towns, roads and monasteries – and when you do, if you had meeple on them, they come back to you and score points (and you can use them again). The key is not to run out of meeple by getting them stuck in unfinishable areas, while trying to muscle in on large areas your opponents may be building – while also placing some meeple as farmers, who will score large open areas but only at the end of the game. Its popularity has spawned dozens of variants, from kids’ versions to more complex and historical editions – while the base game has a raft of expansions available. My preference is Carcassonne: Hunters and Gatherers – a stone age version that takes a few of the best expansion ideas and adds them to the base game. While I’m always happy to play Carcassonne, I’d rather reach for Maori. While similarly light on rules, with quick, smooth gameplay, you’re instead building islands on your own player boards. Scoring is harsh, as any unfinished islands are removed from your board at the end – while also giving you minus points for having unfilled spaces. The tile you take each round is restricted by the position of a boat around the edge of a 4×4 grid in the centre of the table; so you’re thinking about where your next opponent can get, and what they want, when you make your own choice. Collecting tiles with boats and resources can help you move around that area better – but may not score you points at the end if you use them for movement (where tiles with trees are guaranteed points). Lots to think about, despite a small rulebook, and it also packs in several variants to ramp up the challenge. I’ll also mention Kingdomino – an even simpler game where you’re building your own tableau while trying to restrict what your opponents can accomplish. For my winner we return to straight abstract games, and top game designer Reina Knizia. The tiles here are the closest you’ll come to dominoes, with each piece being two hexagons (rather than squares) with one of six colours (rather than a number) at each end. As you place you get points for any matching colours (in straight lines), but at the end of the game your final score is in the colour you have scored least of. This means the outcome tends to be decided on a key tipping point near the end of the game: you’ll spot a particular colour is in trouble, and try to make it more (or less) available to score points – but is it too late? Brilliant with two and fun with three or four, it is the game that got me back into the hobby and is still a firm favourite today. If you like this kind of simple but very thinky abstract game, also consider Qwirkle and Blokus – both of which are suitable for five and six year-olds, right up to adults (Ingenious plays a few years older) – and these are all games that pop up in charity shops, as they’ve been sold for years in mainstream toy stores. The game I’d most expect (and accept) howls of derision for not including here is Reiner Knizia classic Tigris & Euphrates. It’s clearly a brilliant mix of tile laying with area control and clever scoring, but my introduction to it was via a hammering from an experienced player who gave me no tactical help or advice and has somewhat soured me on it. If I see a cheap copy I’ll grab one and am sure that, one day, I’ll be converted. I’d like to give honourable mentions to both Vikings and Ginkgopolis – titles held in very high regard by many gamers, but that I’ve only had the chance to play online and when not really knowing the rules properly. Floundering around like that is no way to gauge a game and both are things I’d like to play properly: anyone fancy teaching? Also missing the cut, that some would expect to see, were Patchwork and Taluva (games I’ve played, and can see why they’re so popular, but that I simply didn’t enjoy) as well as Among the Stars, Between Two Cities and Santorini – games I’ve also played but, unfortunately, really couldn’t see what all the fuss was about. A good shout. I’ve only played online and it didn’t really grab me, but its an interesting take on the genre – very simple ruleset, but with some good emergent strategy.